refer the gist and try you self. slot 是挂在 this.$slots 的这个属性上的，this.$slot['property'] 可以直接拿到 slot 的 vNode. scopedSlot 是挂在 this.$scopedSlots 的这个属性上的，this.$scopedSlots['property'] 可以直接拿到一个函数，这个函数的参数就是 scopeSlots 外传的数据，返回值是 VNode. 所以，jsx 中，通过访问 this.$scopedSlots 来代替 slot 的定义，通过传递 scopedSlots 属性来使用 scopedSlots. event-emitter 这个组件会 emit 4个事件 click, click-two, test-event, test-event-two, camelCaseEvent. 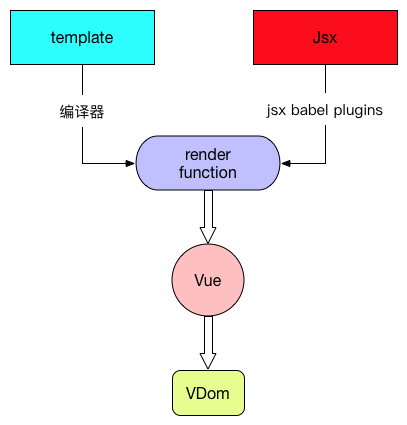 使用 template 时， 我们用 v-on，或者其缩写 @, 来监听事件. 这样写 sync 修饰符的属性当然也是繁琐的，所以参照 nickmessing 的 plugin，我写了一个plugin, babel-plugin-vue-jsx-sync, 来处理 sync 修饰符.